March 1, 2013 -- Scrapbook on Vatican Website on Benedict XVI -- For the fatherly love of Pope Benedict for all of us, Deo gratias. We are deeply grateful to the cardinals for selecting as our universal shepherd Pope Benedict XVI, who is well known not only to Catholics but to the whole world as a man of deep faith matched by a profound intellect. His knowledge of the spiritual confusion and malaise of the world today, and his long experience as a priest, teacher, and, for more than twenty years, close adviser to his predecessor and friend, Pope John Paul II, uniquely equips Pope Benedict to meet the serious challenges to the Catholic Church and the Christian faith in our time with wisdom, insight, courage, strength and grace. We join millions of Catholics in praying for our new Holy Father, that the Holy Spirit will guide and comfort him as he assumes the often profoundly difficult tasks that lie before him. And may St. Benedict and all the saints, and especially Mary, Mother of our Lord, assist him with their prayers. Helen Hull Hitchcock, for Women for Faith & Family; and Adoremus - Society for the Renewal of the Sacred Liturgy. The Faith & Family Award is presented to Catholic leaders who have made outstanding contributions to the Catholic faith and to the family. Address of His Holiness Benedict XVI to the Participants in the Ecclesial Diocesan Convention of Rome, Basilica of Saint John Lateran, Monday, June 6, 2005 "Family and Christian community: formation of the person and transmission of the faith"
Go to vatican website for official announcement. http://www.vatican.va/holy_father/benedict_xvi/index.htm -- Index page for complete list of Pope Benedict's writings, etc as Pope. 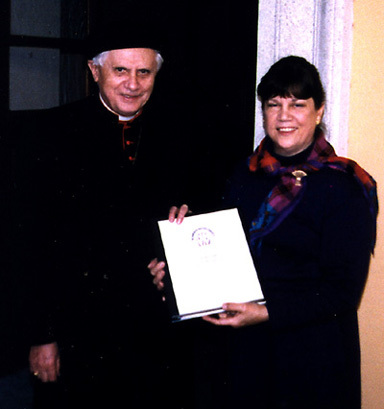 BENEDICT XVI, April 19, 2005 - New page on Vatican website. ..."English translation by the Vatican Information Service of Pope Benedict XVI's first message after his election, delivered in Latin at the end of an April 20 Mass with the College of Cardinals in the Sistine Chapel." "A Simple, Humble Worker in the Lord's Vineyard"